Click here for a Google map to find Bridge 5 Mill, 22a Beswick Street, Ancoats, M4 7HR. From Piccadilly Rail Station walk towards the city centre and turn right up Ducie Street. Then turn right and onto the Ashton Canal tow path at Paradise Wharf (by a large black and white sign for Howarths painted on the wall). Then turn left and continue along the canal path to Bridge 5. Take the steps up to Beswick Street; Bridge-5 Mill is the grey building on your right on the opposite side of the canal. The walk should take about 20 minutes. 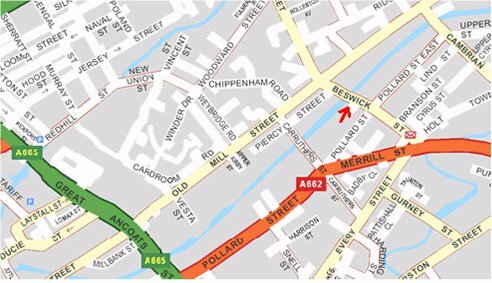 If you prefer to walk along the road, turn left out of Piccadilly Station and then left under the bridge into Store Street and carry straight on into Old Mill Street* until you come to Beswick Street, turn right and the Mill is on the right. If the road is still blocked turn right into Vesta Street and then turn left onto the canal and follow the directions above. Click Manchester Piccadilly Route for a map and a marked alternative route. To reach MEEN you need to take the tram heading to Ashton-under-Lyne and get off at Holt Town. Once you have reached Holt Town station head back towards Ashton New Road and you will find Beswick Street on your right. Walk past Ashton New Road Post Office, The Crusty Cob and cross over Branson Street. Look over the road to your left and you will see a building with black metal railings and the number 22a. Cross over the road and head for that building which is Bridge 5 Mill. From Piccadilly Gardens catch the 216 Bus going to Ashton. Get off at the end of Merrill Street, walk up Beswick Street and Bridge 5 Mill is just after the canal on your right. Click bus route for a map. Please ring the Bridge 5 Mill reception buzzer or MEEN's buzzer or telephone our office.